Novelist Hunter Co-hosts KOOP's “Writing on the Air"
Author Martha Louise Hunter is the new co-host of Writing on the Air, the radio program in Austin purely devoted to the art of writing and creativity. Writing on the Air is broadcast Wednesdays from 6 to 7 pm Central on KOOP 91.7 FM (Austin), and streaming live at KOOP.org. 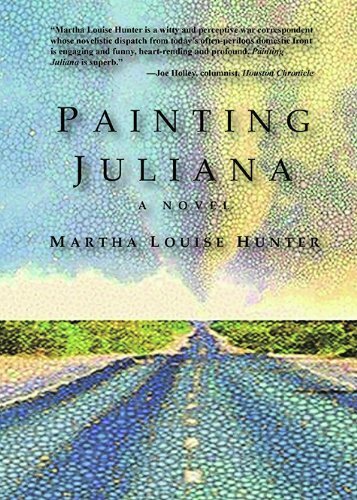 Soon after appearing as a guest to discuss her novel, Painting Juliana, Hunter was tapped by outgoing host Francois Pointeau to become the program’s new co-host, interviewing authors, poets, journalists, screenwriters, historians, and songwriters. The Writing on the Air Collective includes co-hosts Joe Brundidge, Erin Cornett, and Lisa Onland. “We have an incredible writing community, and it’s an honor to contribute to a platform that gives them a voice. The writers come in, pull up to microphone, and we begin a conversation that is live, spontaneous, and unscripted. We routinely veer off topic, and we laugh — a lot! Since way back in another century, KOOP radio show Writing on the Air has let writers talk craft while readers listen in. Originally a Writers' League of Texas joint, in recent years the show's success can be attributed to François Pointeau, a wine seller by day and daydreaming poet at heart. He keeps the literary train chugging by recruiting guest scribes of all stripes. In October, longtime engineer Erin Cornett and newish crew members Lisa Onland, Joe Brundidge, and Martha Louise Hunter will ably take charge of WOTA as Pointeau heads off in a small RV to explore the nation. Writing on the Road, perhaps?